Looking for the best hikes in Norway? 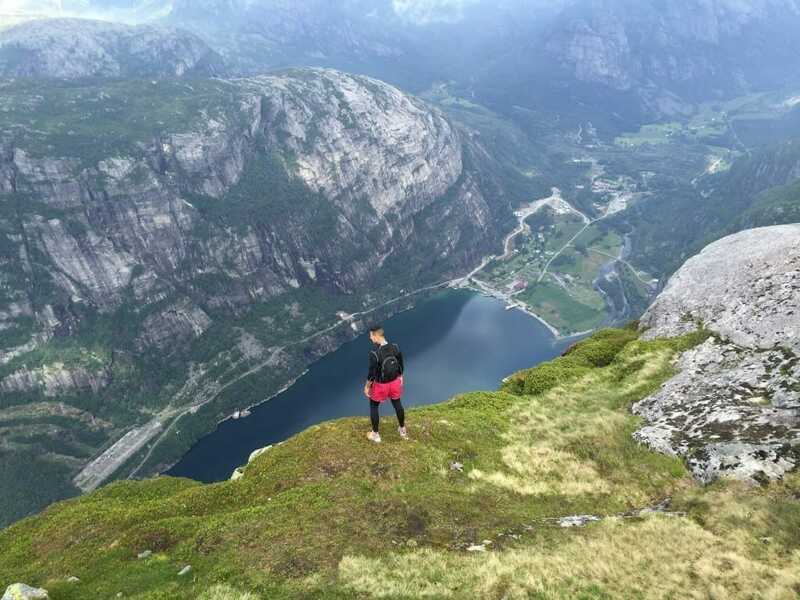 Kjerag, Preikestolen and Trolltunga are in my opinion are the best ones and you can do those three hikes in only three days. After I saw pictures of Kjerag, and Preikestolen (Pulpit Rock) though, Norway jumped from nothing to first place on my bucket list. When I started to plan my next trip to Europe, Norway of course had to be included. It was not easy however, to find information on how to plan the three best hikes in Norway in only three days. I had to consider the time spent hiking plus the time traveling. I was struggling when people from Visit Norway and the bus company Tide Reiser helped me. Everything was finally booked and I was getting very excited to see the breathtaking fjords and to do some of the best hikes in the world! I had no idea what to expect on the there best hikes. I just knew the time to allow for each hike, to carry plenty of water, food, maps and layers of clothes. Stavanger was the start point of my adventures, because only starting in this city I would be able to do these three best hikes in three days. There are plenty of flights from Oslo to Stavanger, and prices can be as low as 29.00 Euros. After a 50min flight, a bus ride from the airport to city terminal, and a 15min walk I arrived at the hotel. I just checked-in, dropped off my stuff and went out to explore the city. Where are the three best hikes located? The bus to Kjerag departed from the Stavanger bus terminal at 7:30 AM. As soon as we left the city I could appreciate the beautiful Norwegian countryside. The weather was cloudy but pleasant. The driver told us a little bit about the local life. 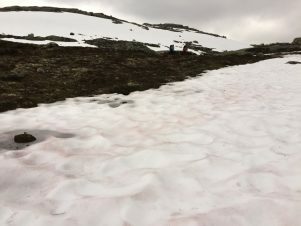 He also said that this year they had a lot of snow, in some places up to 2 to 3m, and in the mountains up to 10m of snow. So, I imagined that the fjords would be covered with snow, which for me would make it even more picturesque. The ride took three hours and 15 minutes, and at 10:45 we arrived at the start point of the hike to Kjerag, the first of the three best hikes that I was doing. 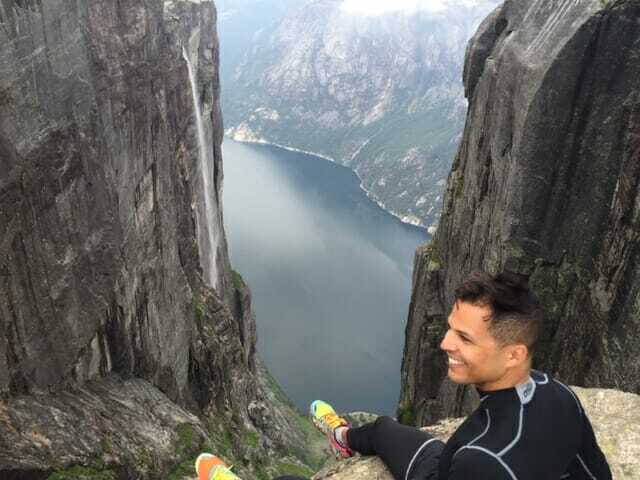 The exciting part was when I walked to the edge of the mountain and could see the fjord. What a breathtaking view! I will never forget when I stepped on the fjord’s edge for the first time. It was high, so high that I was scared of falling, but at the same time an adrenaline rush motivated me to stay there and take it all in. I just stood there with a smile like a child in an awe-inspiring moment. Of course I could not miss the opportunity to photo it. After 1:50 hike I arrived at the Kjeragbolten (the suspended rock). 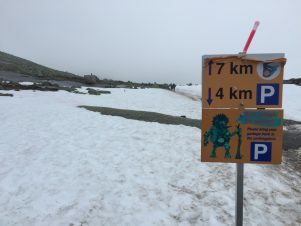 The final 10m was covered with snow, and I warned people who were taking pictures that it was more dangerous than on the top of the rock itself. As soon as I got in line I heard from an Italian lady: “Ma che paura.” (I’m so scared.). Her boyfriend warned to not look down. I confess that before I stepped on the suspended rock, I looked down and got some butterflies in my stomach because it’s around 1000m high. 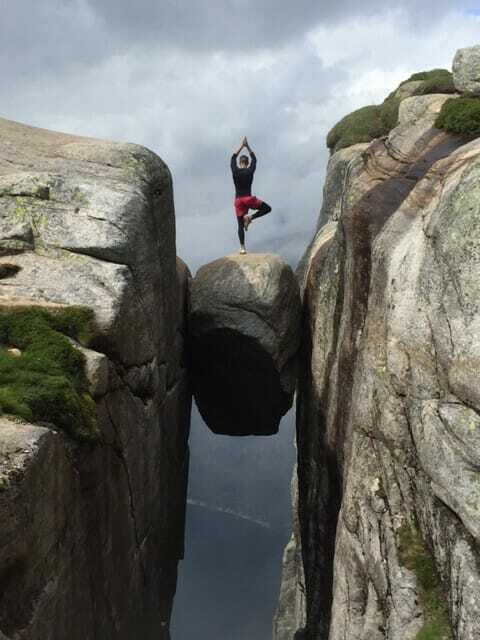 However when I climbed on the rock I felt so exuberant that I even did some Yoga poses. The weather changed a lot that day, partly cloudy, mostly sunny and then foggy. The view of the fjord was unbelievably beautiful!! Three waterfalls, snow and the fjord’s lake made up the magnificent scenery! I was surprised, because I had only seen pictures of people on top of the rock; I had not imagined all those waterfalls. I couldn’t resist and I sat down on the edge again to contemplate the stunning views and take some pictures. I would say the Kjerag was the most difficult one of three best hikes that I did in Norway. The next day I woke up early in the morning to have breakfast, checkout of the hotel and take a 40min ferry, then a 20min bus ride to Preikestolen. When I got there I left my luggage at the mountain lodge. It was such a beautiful sunny day, perfect for this hike, and perfect to enjoy the wonderful view from Pulpit Rock. From the beginning of the hike I realized that this hike would be completely different from Kjerag, actually all these three best hikes are completely different from each other. There were plenty of trees, an easy path to follow, and I could enjoy the view of a beautiful lake when I turned back. I was not the only person who decided to enjoy this lovely day and visit one of the most famous points in Norway. 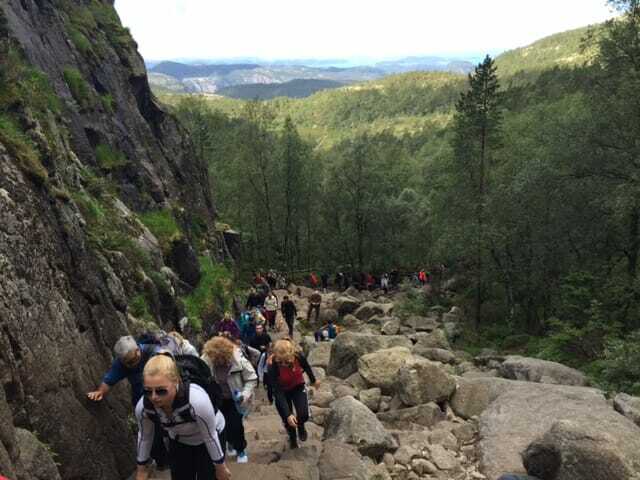 The trail was so crowded, people from everywhere and of all ages, from babies strapped to mother’s/father’s chest, to seniors, and even dogs (actually I saw dogs on all the hikes that I did in Norway). The path was narrow and I had to follow it in order to get to the summit. It meant that I had to wait and respect every one else’s pace. 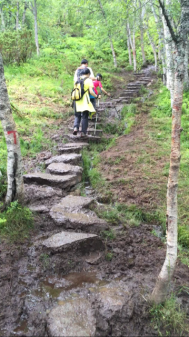 There were also a lot of rocks to help make the steps, plus mud and lush vegetation providing shade and a magnificent vista. The only way that I could see the fjord was the final kilometer, exactly where the path disappeared and I was able to walk anywhere on the plateau, until the last meters where I could reach Pulpit Rock. Preikestolen was the easiest and most pleasant one of the three best hikes that I did in Norway. The bus ride was something that I will not forget. I believe this was the most beautiful ride that I have ever taken. The road meandered through snow-covered mountains full of trees with hundreds of waterfalls, rivers, and lakes. I was speechless the whole trip, refusing to sleep so as not to miss anything. I walked from one side to another taking pictures. My thought was: I wish I had a car to stop every one hundred meters and take thousands of pictures. I knew there was a famous waterfall by the road near where I was staying in Odda camping. When the bus passed it by, I was not able to see anything because the windows got completely wet. 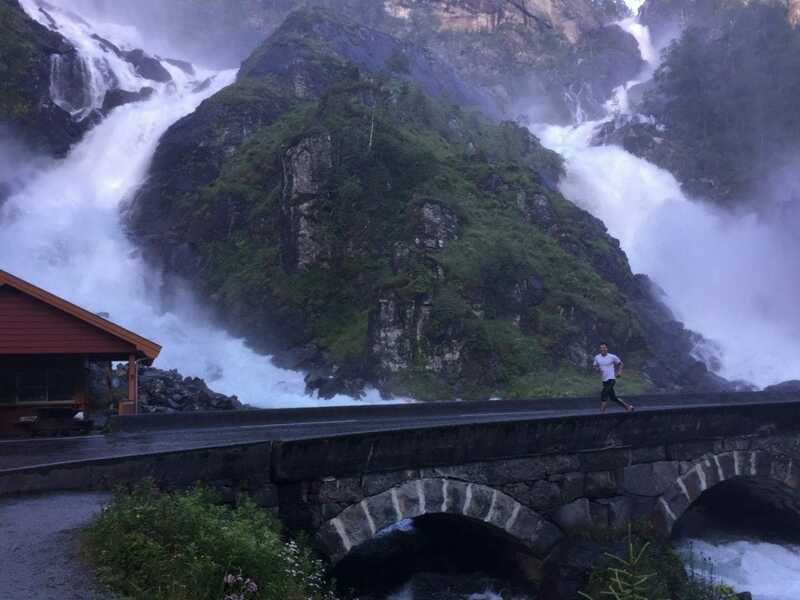 When I arrived in Odda, I checked into the campsite and asked for directions to go for a run to the waterfall. The receptionist told me that the waterfall was 10 Km away with a tunnel on the road, which would make the run very dangerous. So, I had to hitchhike… A Spanish couple stopped and gave me a ride. I got the greatest joy of my trip running past the waterfall. It was so glorious, that I ran back and forth in front of the falls four times. I was soaking wet, but extremely happy. I’m not sure it was my favorite moment because I finally got see and enjoy the waterfall, or because it was the day before my hike to Trolltunga, the most famous one of three best hikes in Norway… perhaps both. 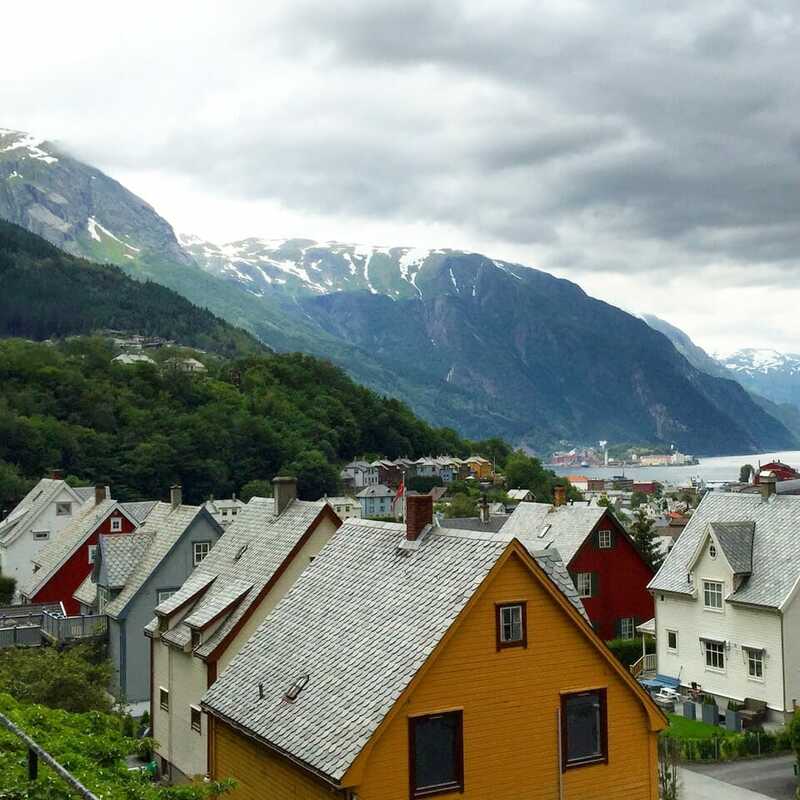 On the way back I hitchhiked again; I got off in downtown Odda to have dinner and get some groceries for the hike. After a delicious Norwegian salmon and a glass of excellent wine, I was ready for my Trolltunga hike the next day. I woke to find that the weather forecast was cloudy with a few showers. I would have been very lucky if it were sunny; this region has only a few sunny days a year. I was feeling like going back to bed on that gray day, rather than doing a 22 Km hike. I was hoping to hitchhike again to Odda downtown, instead of walking the 2Km to the bus terminal. No luck. Well, I had to put myself together, and walk to the city terminal. It was a very picturesque walk, on a road surrounded by mountains, waterfalls and beautiful traditional Norwegian houses. It was a terrific warm up to the day. The bus took around 20min from Odda to Skjeggedal, the start point to Trolltunga. The parking lot was in front of a waterfall and on the other side there was a lake surrounded by mountains. It also provided restrooms, and there was a store close by. I thought that there would be many people doing this hike, but surprisingly there was not. In front of me were two couples from Asia who took the bus with me, and another couple also from Asia with a nine years old daughter was just starting the hike. I started the first kilometer so keen that I left them behind easily. But it was so muddy and steep that it became more difficult. I didn’t know where to place my feet because everywhere was slippery. In some parts I could see the steps, others just footprints of other hikers. 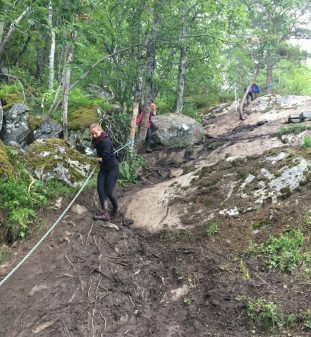 Even the rope, which was there to help people to climb the hill, was full of mud. I took deep breaths and thought: OMG, if the first kilometer is like this I do not even want to think about how the others are. I saw the Asian father slip and fall and I stepped both of my feet in the mud. I met a German couple, and the guy told me that the first kilometer was the hardest one, and in fact it was. It took me 40min to hike the first kilometer, and using my math skills I figured out that it would take me 400min (more than 6h) to do 10 more kilometers. It was my original intention to do the hike in around 4h. No way! The second kilometer however got better; it was not that muddy and steep anymore and the view was so beautiful that I wanted to walk backwards just to appreciate it. Trolltunga’s summit is 1250m above sea level, and the more I climbed the more I hit areas covered with snow. I crossed so many snowy areas that it felt as if I were walking on a glacier. I learned two facts on this hike: in some parts I saw a small blue lagoon which is typical of glaciers, and in others I could see a pink spot, which I learned is caused by the Sahara desert’s dust and is very common in the European Alps. Besides the ice, snow and mud, I passed by many waterfalls and stream water. I thought it was quite interesting to walk on a very thick block of ice with water running underneath it. When I got closer to the summit I could see the fjord better. The landscape is sensational and it’s impossible not to stop to take pictures. 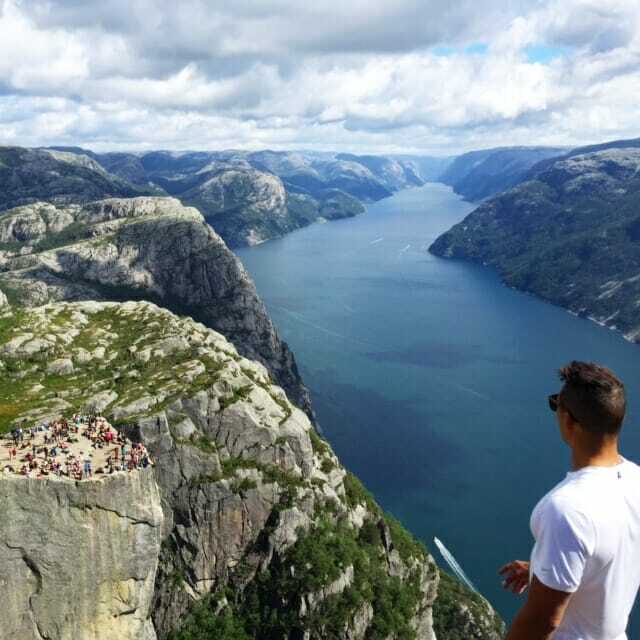 Some of the most spectacular scenic cliffs of Norway are here! Every time I passed a kilometer sign I got more excited and I began counting down: only 5 km left, now only 4Km… I was so intent on the summit that I even missed the 9km sign and I was so surprised to see that I had only one kilometer left. I joked with another hiker that I would do the final kilometer running. To my surprise, he said, “let’s go” and we did just that. We ran like a crazy! It felt so euphoric, oh my God!!! We ran on the ice, climbed rocks got lost and finally we realized we were facing the summit: Trolltunga (Troll’s tongue). I was speechless! Being on top of Trolltunga is something hard to put down in words. All the effort, 11 Km in 4:20, was completely worth it. (Yes, I was even close to my original four-hour estimate). 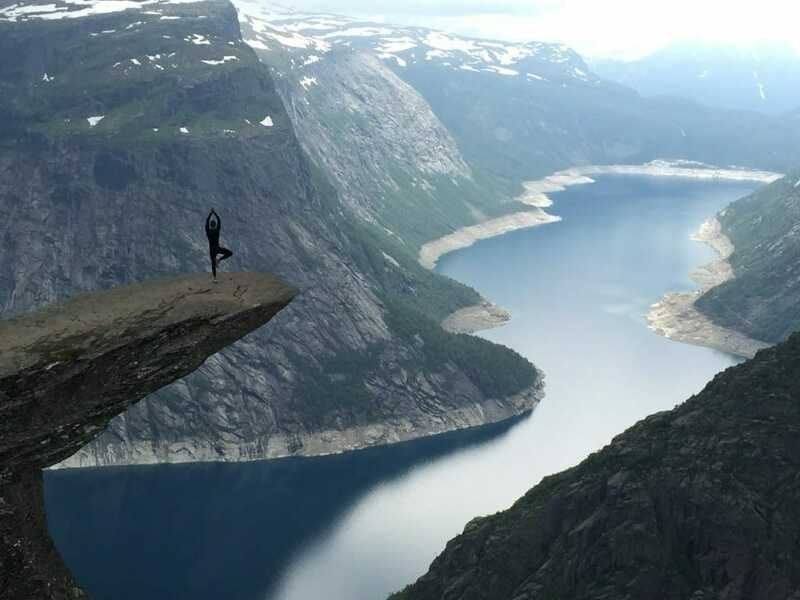 Trolltunga is something beyond magical and breathtaking. It is a place that is hard to believe exists. The best picture location was walking out on a rocky ledge. I had to wait while other hikers had their turn inching their way out onto the ledge. The 30min was endless. I was so cold… but the view was so rewarding. I walked a little more to contemplate the fjord from other perspectives and then I started back down. I did not mind the 11 Km walk. Quite the opposite, it was a chance to admire the stunning landscapes one more time. What extraordinary vistas there are in Norway! It took me 3:20 on the way back, which was quite impressive for me. The first kilometer now was the final, and it was still the worst one. While I walked down the mountain I contemplated that exquisite landscape for the last time, I wished I could stay longer and explore more of that area. 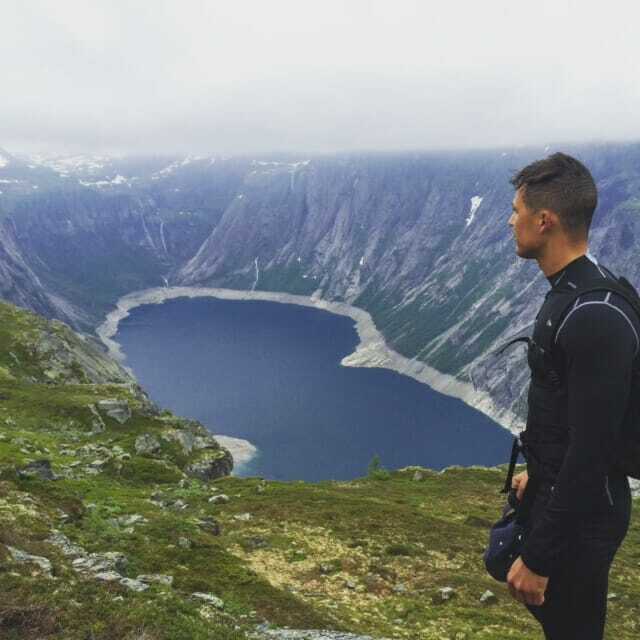 Trolltunga was the longest and my favorite one of the three best hikes in Norway. I would do it again definitely. I woke up early the following morning to have breakfast, pack my things, check out and take a bus to Bergen, Norway, and from there, my flight to Copenhagen, Denmark. Norway is a country that cannot be missed! It is a country that shows you how spectacular and magnificent Mother Nature can be. If you love hikes as much as I do, check out which are The Best Hikes in Europe. You can check the map here. ∗ By bus: there is a bus running from Stavanger to Øygardstøl operated by Tide Reiser. ∗ By car: to get to Øygardstøl you need to take the ferry to Lysebotn and continue by car, or drive there via Sirdalen (this road is closed in the winter). Travel time: 2,5 hours one way (from Stavanger). ∗ There is a paid parking at Øygardstøl. ∗ By bus: there is a ferry from Stavanger to Tau and a bus from Tau to the Preikestolen operated by Tide Reiser. ∗ By car: From Stavanger take 39 south to Sandiness, 13 east to Lauvik, crossing the ferry (NKr 58 for a car, not including passengers) to Oanes, and continue to Preikestolen (well marked). ∗ There is a paying car park in Preikestolen, an information booth and sanitary facilities. ∗ By bus: there is a minibus departing from Odda main square to Skjeggedal, which is the start point to the hike. There are daily departures by bus/maxi taxi between Juny 15th and September 15th. If you are in Kinsarvik/Lofthus you can go by public bus service to and from Odda. Itinerary for line 991 (Geilo – Odda). ∗ By taxi: you can contact Odda taxi on tel. +47 53 64 14 44 or post@oddataxi.no. 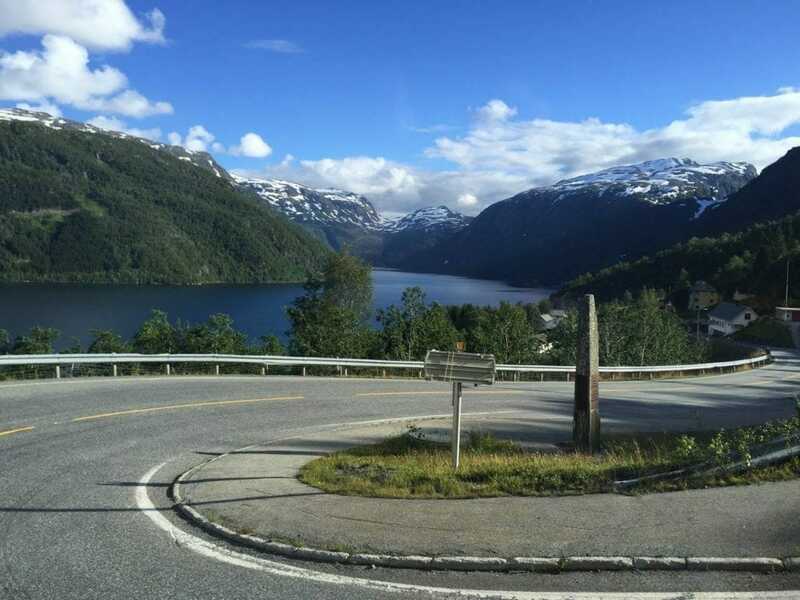 ∗ By car: drive to Tyssedal (6 km from Odda) on route 13. 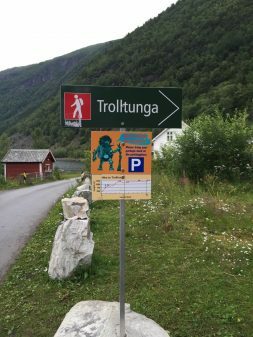 Follow signs to Skjeggedal and Trolltunga. After about 7 km you reach the parking place in Skjeggedal. Parking in Skjeggedal (200 NOK/day) or Tyssedal (100/day) (2016). The parking fee is used to finance public facilities in the area. Travel from Stavanger and Preikestolen (this was what I did). 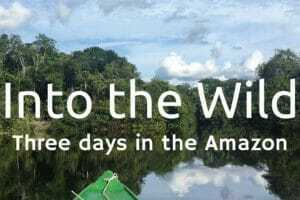 ∗The hike is open from May to October/November and it’s recommended to do during the summer (from June to September). 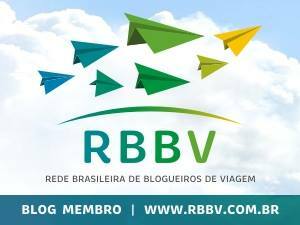 ∗The bus runs daily from June to the beginning of September (in 2018 from June 9th to September 2nd). 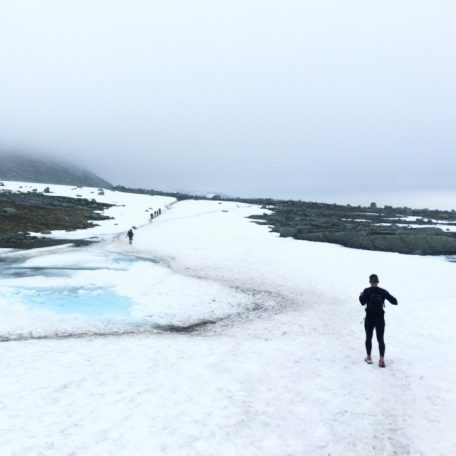 The recommended season to Trolltunga is from June 15th to September 15th. 16 September-28 October recommended with guide. 17 February-14 June recommended with guide (snowshoes). 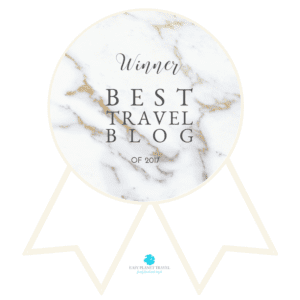 I stayed at Scandic Stavanger City and Odda Camping. ∗ Bus ride: US$ 64 to Kjerag. ∗ Bus from Odda to Skjeggedal: 250 NOK (US$ 30). All the hikes in Norway are at your own risk. ∗Bring food, water, maps, and a first aid kit. 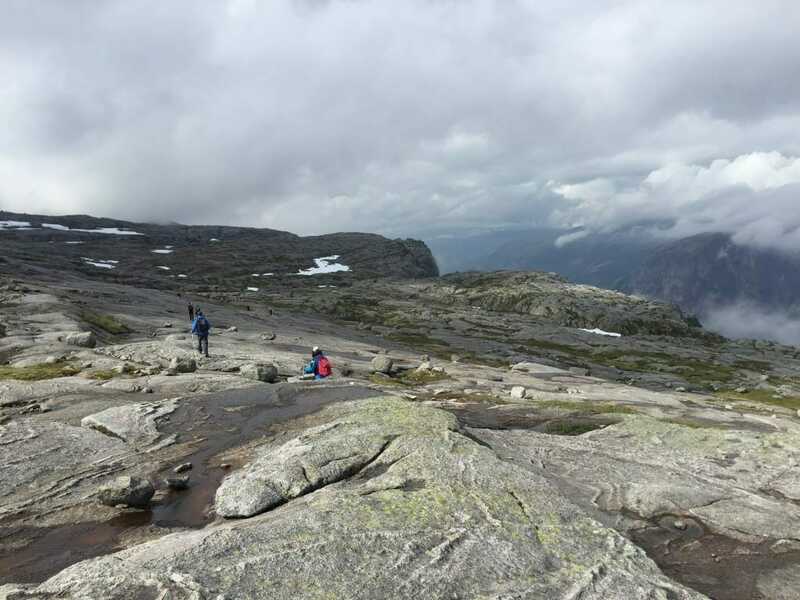 Have you ever done at least one of these three best hikes in Norway? If you did, or want to do it, leave a comment bellow. Hi! I have a question… what time of the year was this? Couldn’t find it! I’ve done Trolltunga in summer few years back and I am considering coming back now this easter (mid-late April) to do the other two. Where were you there?? 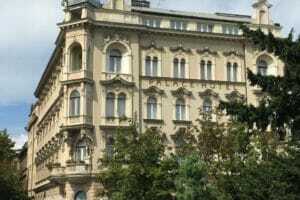 I was there exactly during the summer (beginning of August). Trolltunga is better from middle of June. Even in May is a king of hard. I had a friend who did that in May and she said it was very tough. I would not recommend you to do it in April. For the other two it’s “ok”. I’ve seen people hiking the Pulpit Rock in November and it was covered with snow. If you have any more question let me know please. You also need to think about the transportation Eva.